Founded in 2003 by Kayla D. Zeigler, Destination Europe is an internet based company backed with years of industry experience and over 13 years of first-hand European travel experience. 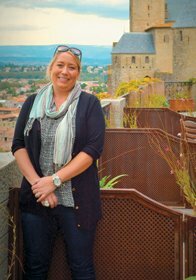 Kayla Zeigler is a certified European Destination Specialist from the Travel Institute and has personally traveled to most of Europe on her own. Also certified as a European Rail Expert, Kayla's favorite mode of transportation is traveling as the Europeans do - by rail. Kayla has traveled all over Europe independently and with friends and family and uses her personal travel experiences and knowledge to plan and prepare customized packages and tours of Europe. At Destination Europe, we value our customers first and foremost. We design and plan each Europe luxury travel package as if it were our own, making sure to include every intricate and important detail to ensure that your vacation is nothing less than the trip of your lifetime. Whether you will be celebrating your honeymoon in Europe, exploring with your family, or traveling with friends, we are experts in creating the perfect European adventure. All of our Specialists have first-hand travel experience in Europe, so we can guarantee the value of our work. Because we are European specialists, we make sure that you, as our most respected client, trust us in our knowledge and expertise to make sure that your trip is just as you imagined. Call us today and we will tell you how we can create that dream vacation within your budget and what separates us from an ordinary travel company. You will not be disappointed. We are a small company that believes in excellent personalized service. Our specialty includes creating custom tailored and independent packages to Europe that allow you to have as much or as little free time as you need. We also offer guided and escorted tour packages from various tour suppliers and providers. We can accommodate all needs from guided and escorted packages to fully independent packages. We offer planning services for family travel, group travel, luxury travel, couples travel, and much more. Destination Europe is affiliated with several major industry organizations such as the American Society of Travel Agents (ASTA), the Travel Institute, Travelagencies.com, NACTA, OSSN, and CLIA. We have memberships with all of these organizations ensuring to keep up to date with the latest travel news, trends, deals, packages and industry information.